It is now official. SUPP president Dr George Chan has all but confirmed that Alfred Yap Chin Loi will be the party’s candidate for the Kota Sentosa seat in next state election. Speaking at the SUPP Kota Sentosa Branch anniversary dinner last week, Dr Chan was full of praise for Yap, saying that he had worked tirelessly after losing the contest to DAP’s Chong Chieng Jen. The interesting question is: Who will Yap face in Sentosa? It will be a classic clash of the titans if Kota Sentosa sees a Yap-Chong re-match. But this tiger is willing to bet that the incumbent Chong will move to fight SUPP in another constituency. After speaking to senior party leaders on both sides, I am convinced that Chong is searching for a safer seat. Much has changed since 2006. It was then the “political tsunami” that had vanquished SUPP heavyweights and swept in many DAP unknowns. Four years later, the conventional wisdom still predicts a greater SUPP loss at the looming state polls. But forget conventional wisdom. In the next Sentosa match, the SUPP candidate and DAP incumbent both agree on one thing: they do not like to face each other. Chong will prefer not to fight Yap. It is a much stronger Alfred Yap whom he had beaten by 531 votes in 2006. Whereas Yap started the campaign for the next election the next day after he lost, Chong cannot claim to have done much for the constituency. Many of Yap’s supporters are residents of the new constituency and who knows how many have registered to vote in Sentosa. Yap will prefer not to fight Chong. Once bitten, twice shy, they say and I think Yap is hoping that Chong will run away to a safer seat. How now? Both candidates are afraid of each other. Interesting, isn’t it? As Chong surveys the possible battlefields beyond Sentosa, he will no doubt turn his eyes to Padungan and Batu Lintang. And again if you listen to the proverbial conventional wisdom, these are sure-lose seats for the SUPP. If Chong chooses to stand in Batu Lintang, it will be sweet victory if he can beat likely candidate Sih Hua Tong. The only problem will be Voon’s supporters. They may not take too kindly to Chong if he kicks Voon to face certain death in Sentosa. Padungan will be also on Chong’s radar if unfolding events favor him. If Chong wins the lawsuit against Padungan incumbent PKR’s Ng Kim Ho and if Ng is made a bankrupt, the DAP will lay claim to Padungan. 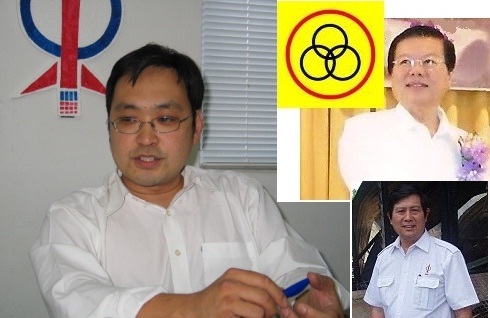 We all know that the Chinese majority Padungan seat has always been claimed by the DAP. Not yet convinced that Chong will run away from Sentosa? Why is Chong keeping silent about defending Sentosa? Why have Chong and Yap not attack each other? Chong has been on attack mode but has not let loose on Yap even after Dr Chan has confirmed Yap will be SUPP’s preferred candidate. Does Chong already know he will not be defending Kota Sentosa? A number of Batu Lintang constituents who are clearly Voon Lee Shans ardent supporters clarified to Joey of audie1 that Voon is not running away from the battles and the just needs QUALITY TIME to be with his family as he ponders his next move.” He has been given a showcause letter by DAP party headquarters in Kuala Lumpur as such he needs his families undivided support to clear his mind and find the appropriate answers to the contents of the letter. One should refrain from making unnecessary and unfounded judgements that Voons time is numbered and he will not be named to defend the N11 Batu Lintang State Seat. We have been hearing from ground zero level that since the sms that has been sent out by Voon to the press,comrades,friends and relatives with regards to him ,”Not celebrating Chinese New Year in Kuching” the final nail has been delivered. Afterall this is politics and there are no predetermined solutions to all problems. Voon has 14 days to reply and we shall know in due course whether the TIGER YEAR will be kind to the N11 assemblyman. A political watcher sent an sms to Natasha of audie61,”Whats wrong with DAP N11 Voon Lee Shan.? He seems to be in a lot of bother lately and judging from what is written in his blog. Absolutely he is now been sent to substitutes bench. Want to know more click HERE to his blog.